Recorded in many forms, this is an English medieval surname. However spelt it is a dialectal variant of the surname Hutchings, itself the patronymic form of Hugh, a very popular name in the Middle Ages. Hugh is pre 7th century and surprsingly perhaps is derived from the Germanic word "Hug", meaning heart, mind, or spirit. The names as Hugh and Huchin were introduced into England by the Norman-French after their successful conquest of England in 1066, and their takeover of much of Scotland by diplomacy in the following two centuries. The popular spellings at the time were Hue, Huecon andHuchon and these soon generated their own surnames in both England and Scotland. 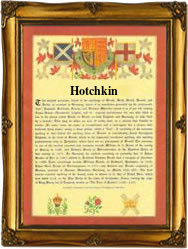 The name development over the centuries has included examples such as John Huchouns of Essex in 1327, and Cecily Howchyngs of Norfolk in 1523. Amongst the sample recordings in London are, one Elizabeth Hutchin who married Thomas Atkinson, on July 7th 1659 at St. Gregory by St. Paul, and Issabell Hotchin who married John Watton on November 10th 1670, at St. James, Clerkenwell. The first recorded spelling of the family name is shown to be that of Gilbert Huchun. This was dated 1296, in the Sussex Subsidy Tax rolls, during the reign of King Edward Ist, known as the Hammer of the Scots, 1272 - 1307. Surnames became necessary when governments introduced personal taxation. In England this was sometimes known as Poll Tax. Throughout the centuries, surnames in every country have continued to "develop" often leading to astonishing variants of the original spelling.